If you install the D-Link DGE-560SX in your servers, you will benefit from Gigabit connectivity and the higher performance offered by the PCI Express (PCI-E) architecture. This enables you to deploy a highly stable, scalable, high-speed network solution at an affordable price. 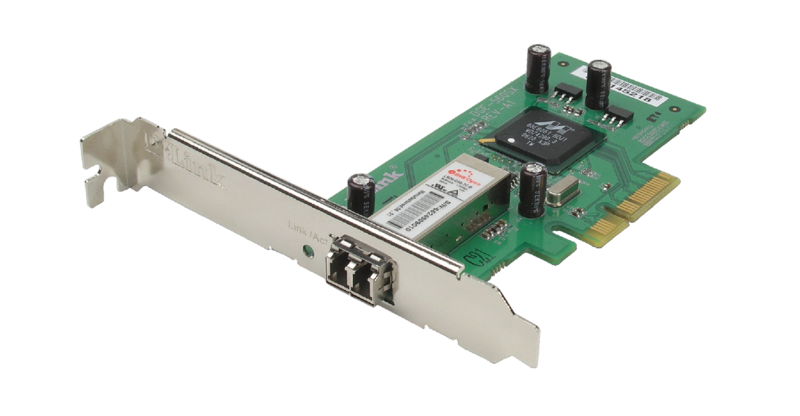 The DGE-560SX Fiber Gigabit PCI Express x4 Adapter is a high-performance network card that lets businesses take advantage of the PCI Express (PCIe) slots of their servers to enhance network performance with fiber-optic connectivity. The PCIe architecture ensures dedicated input/output (I/O) bandwidth for the adapter, ensuring high performance without bus sharing for Gigabit Ethernet connectivity in fiber-optic networks. The DGE-560SX supports 2Gbps transfer rate between the adapter's board and the server host. It provides unsurpassed robustness, reliability and performance, and is the optimum I/O connectivity solution for a wide spectrum of server, storage and system area networks (SAN). As a successor to the PCI and PCI-X interfaces, the PCI Express serial bus eliminates many of the inefficiencies of parallel PCI and PCI-X architectures. With lower pin counts and lower power consumption requirements, the DGE-560SX adapter also reduces system power requirements. PCI Express is backward compatible with PCI and PCI-X addressing, which allows all existing applications and Operating Systems to function unchanged. With fibre optic cable, distance can reach up to 550m and network speed 2000Mbps (full-duplex). The adapter offloads the host operating system overhead by providing on-board verification of IP header and TCP/UDP checksum for data received, in turn freeing up server processing power for other applications. The DGE-560SX adapter provides on-board screening of VLAN tagged Ethernet frames compliant with IEEE 802.1Q. This allows the server to operate in a flexible and secure network configuration in a standards-based environment. The adapter supports 802.1p Priority Queues for improved delivery of delay-sensitive data such as voice and video. The DGE-560SX supports other advanced features such as Jumbo frames of up to 9KB and Promiscuous mode. It supports ACPI (Advanced Configuration and Power Interface) specifications to enable OS-directed configuration and Power Management (OSPM) to enumerate and configure server motherboards. The adapter supports SNMP agent for management under an SNMP-based platform. It is often difficult or impossible to schedule downtime on a server to replace or install peripheral cards. As a PCI Express card, the DGE-560SX provides native support for hot plugging and hot swapping, which makes it ideal for installation in a server. This hot swap capability makes it easy for network administrators to add, change or remove I/O peripherals while minimizing the server downtime.